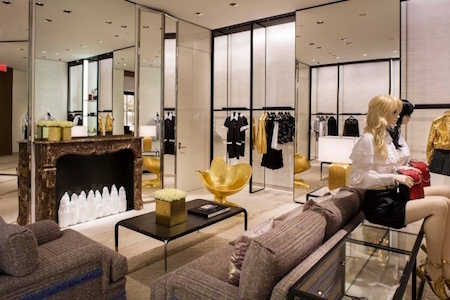 Chanel has reopened its store at South Coast Plaza Mall, in Orange County, California adding 2000 sqf to the existing 7.000 sft., within proximity of Tiffany’s and Nordstrom. 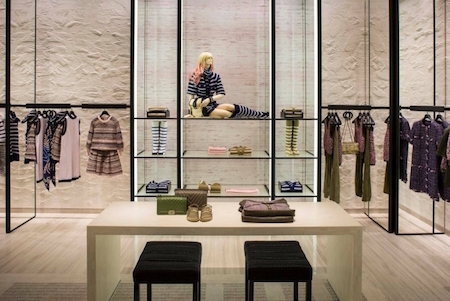 The new revamped Chanel store, designed by one of best interior designers nowadays, Peter Marino, features the complete range of Chanel products, with dedicated spaces (”salons”) to ready to wear, accessories and shoes. 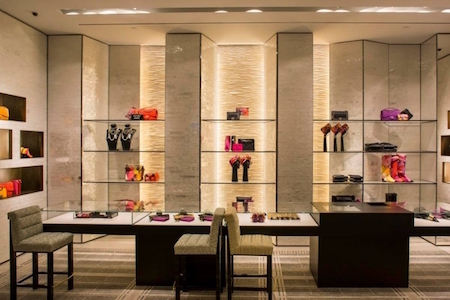 Some of the salons are adorned with hand-made gold woven material designed especially for the boutique. For the stunning confection, Marino chose a glamorous palette of gold, black, and rosy pink, with bespoke upholstery that riffs on classic Chanel tweeds. Marino referenced vintage Chanel aesthetics to inform the new space. The fabric covering the first floor stools and stairway carpeting is a nod to the label’s famous tweed. 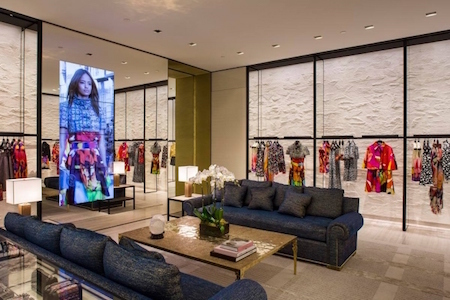 The costume jewelry display on the Maiden Lane side of the shop (it also has an entrance on Geary) was inspired by the Coromandel screens at Coco’s rue Cambon Paris apartment.